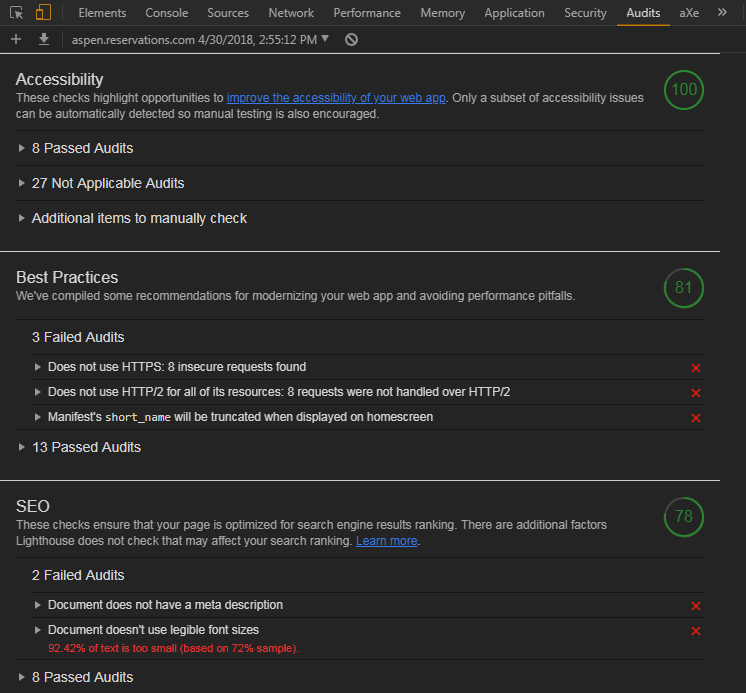 It was only recently that I was made aware of Lighthouse, a relatively new tool for running notable audits for web apps. It’s an open-source tool from Google, and can be found inside Chrome’s DevTools under the Audits tab. Apparently we did good on accessibility, SEO, and best practices. We don’t usually test for these things, but it’s nice to know that we do enough on them. The application running on localhost wasn’t configured to run on HTTPS yet so it’s about right that we failed that audit for best practice. It’s also true that our app was designed to have small font sizes. What’s interesting to see was the dreadfully poor app performance. Throttling our page on a mobile device with 3G connection, it took at least 20 seconds before anything appeared on the page. That’s not good. It seems we can do better with our images and style sheets. And it also looks like our JS takes too long to boot-up. 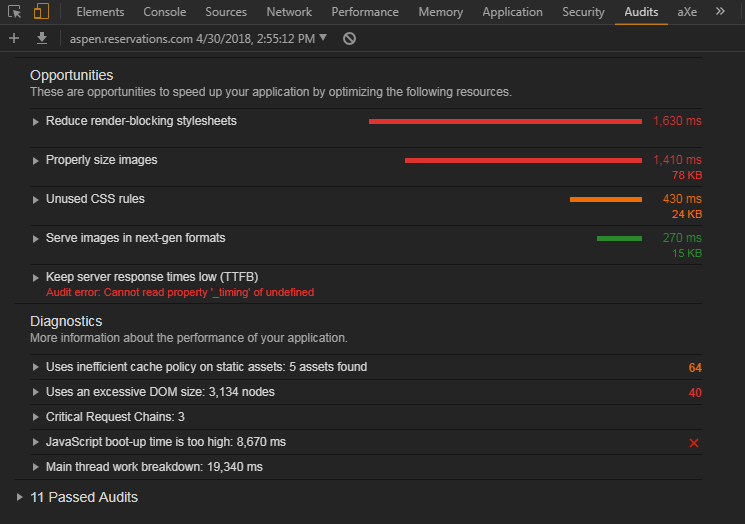 We don’t exactly do high-detail performance testing at work so it is awesome to have such a quick audit report from within the browser that notify us about such issues early. At least we’ll know the areas where there’s room for improvement right away. 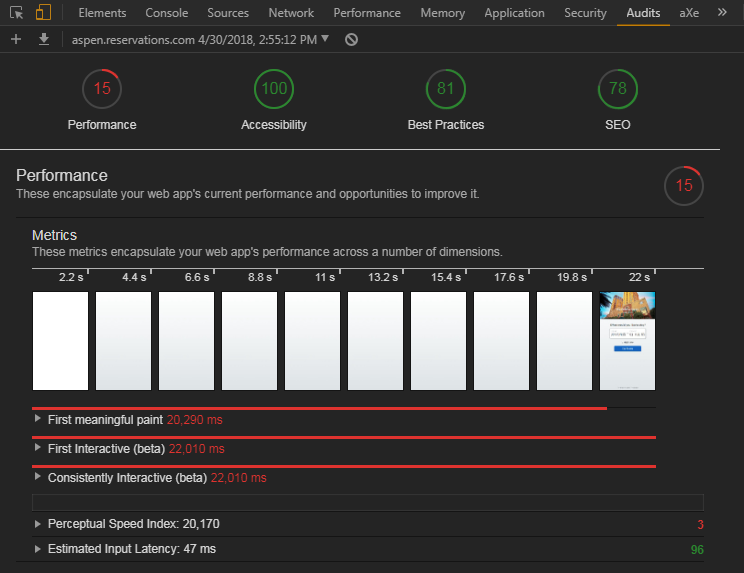 There’s no excuse to not testing performance (as well as SEO, accessibility, and best practices) on a web app anymore, as far as tools are concerned.